Translation has always been a subtext of analytic work. We carefully read each word of Freud’s Standard Edition, which itself was translated from the original German to English. We listen to dreams, which also demands multiple translations: from the dreamer who both dreams the dream and then reconsiders it once awake; and then communicates that memory of the dream to the analyst. We hear the patient describe experiences which also are translated into communications, perhaps symbolized and then understood in a new form. In addition, many of us work with patients whose Mother Tongue is not English. We think about the shift in meaning between the described experience and its perceived meaning. 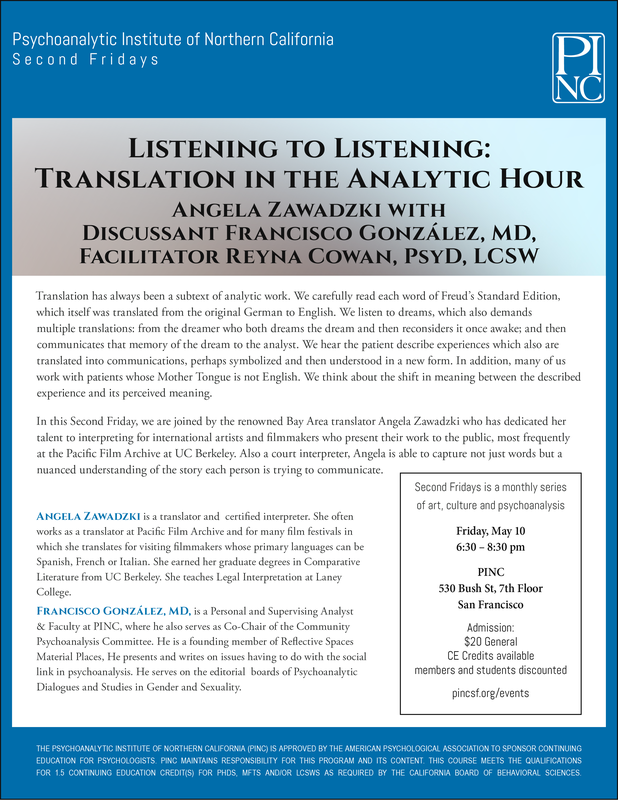 In this Second Friday, we are joined by the renowned Bay Area translator Angela Zawadzki who has dedicated her talent to interpreting for international artists and filmmakers who present their work to the public, most frequently at the Pacific Film Archive at UC Berkeley. Also a court interpreter, Angela is able to capture not just words but a nuanced understanding of the story each person is trying to communicate.